A driver who caused thousands of pounds worth of damage by performing wheel spins will have to pay for road repairs, a council official has said. North Yorkshire County Council had recently resurfaced Royal Albert Drive in Scarborough as part of £600,000 of improvements to the area. 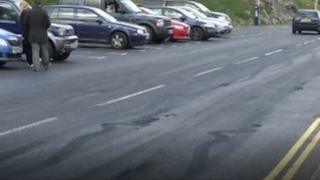 The road was damaged during a car meet-up on Sunday. David Bowe, from the council, said they would pursue some of the £50,000 repair costs from the driver in a civil claim. "We've got to stamp this out," the corporate director for business and environmental services said. "This individual has got to understand that they have caused wanton damage to public property and that can't be tolerated by the residents of North Yorkshire." Emergency repair work is under way because to rectify the damage caused by the wheel spins, which has shredded part of the road's surface. Mr Bowe said the council had the car details and driver's name as well as witnesses and video evidence. "The team involved in doing the work is spitting feathers," he said. "They put all the hard work in, there's inconvenience for the people in Scarborough and then we're faced with this. It's incredibly frustrating."